Have you seen the page about 'Fuel densification'? On larger ships saving 10% or so of space/volume can add up. Even on small ships like the Hammer, every small amount shifted from fuel to... well... ANYthing else is a bonus. I've seen the article and I think it is a step in the right direction. I've always felt the fuel requirements were needlessly high. If I were to fix it I would shoot for more like 50% reduction. 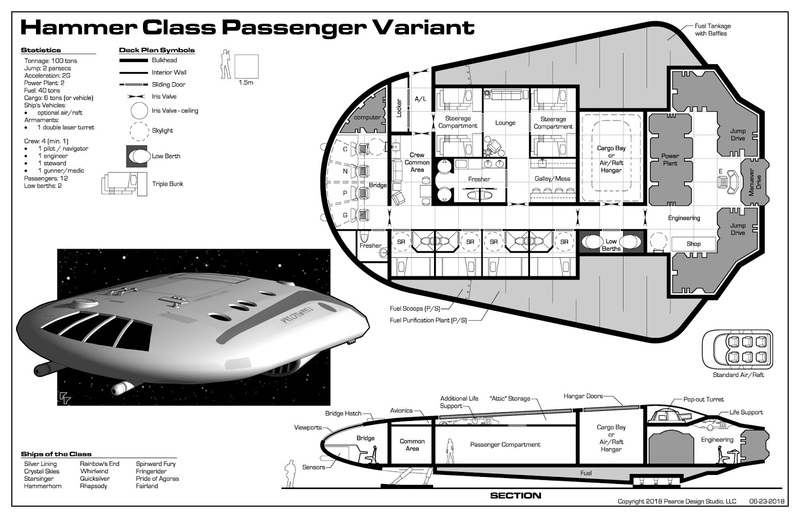 Regardless, I won't be including anything like this in my ship designs until it becomes canon. Thanks again for the Hammer suggestion. Glad you like the new design. I do have a question: where does the Crew eat? Do they share the facilities with the Passengers? Or is the Steerage area for Passengers only? Thanks! The crew eats in the Crew Common Area. There is a small galley between the couch and the ship's locker. Crew and passenger facilities are completely separate. I like the steerage concept. Brings back memories of Navy ship berthing compartments.